Cher dropped out of high school and at age 16 she had her first brush with stardom when she was involved in a minor fender-bender with Hollywood lothario Warren Beatty. Beatty seduced her, which Cher remembers as "a disappointment". At 17 she wandered into a Los Angeles coffee shop and saw a goofy-looking 28-year-old man at a table. When their eyes met, Cher has said, "It was as if the whole room went to soft focus, like Tony and Maria at the dance". The man was Sonny Bono, then a menial worker in the recording industry and a part-time percussionist. They moved in together almost immediately, but the initial arrangement was strictly platonic, with Cher trading maid services for rent. Bono was impressed by Cher's singing ability, and introduced Cher to his boss, Phil Spector. But Cher was very nervous, and when she sang for Spector her voice was unsure and he was unimpressed. She felt more comfortable when Bono accompanied her, and though he could barely carry a tune, their sweet, almost innocent chemistry somehow made the music work. They performed as Caeser and Cleo, and had some success at small night clubs. When Bono wrote "I Got You Babe", it became their first hit and an enduring standard. As Sonny & Cher, they had numerous hits in the mid-1960s, but their success waned as psychedelic rock and hippie music took over the charts. Bono used some of their accumulated earnings to finance two films: Good Times, a musical comedy starring Sonny & Cher, and directed by William Friedkin, and Chastity, with Cher sans Bono turning in a decent dramatic performance as a tough but vulnerable wanderer. Bono wrote the screenplay and score and produced the film. Both flopped at the box office, and Sonny & Cher were considered passé. The duo continued performing together, in smaller venues. Cher wanted to change their sound, but Bono would not allow it. In performances, she sometimes vented her frustrations by insulting him on stage. Both performers noticed that audiences laughed; soon these jabs at Bono became a part of their act, which began getting renewed notice and drawing larger audiences. They were eventually booked in Las Vegas to great success, and then were invited to bring their schtick and song act to television. The Sonny and Cher Comedy Hour was a popular success, fueled by her zingers aimed at Bono, but tempered by what seemed to be genuine love as they ended each show with "I Got You Babe". Their old albums began selling again, and Cher recorded some new hits without Bono. With her increasingly outrageous Bob Mackie-designed costumes and musical success, Cher's star had far eclipsed Bono's, and she grew impatient with his Svengali-like control of her career. When she had friend, sometime lover, and future Hollywood mogul David Geffen look at her contract, she learned that her career was virtually owned by Bono. Cher filed for divorce in 1974. 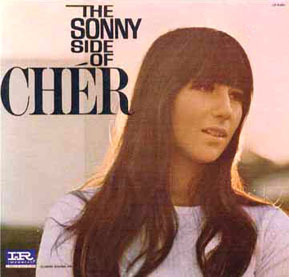 Bono went on to star in The Sonny Comedy Revue, and Cher starred in a variety show dubbed simply Cher. She admitted that she was terrified to be on television alone, but her show lasted two seasons while Bono's lasted only 13 weeks. They then re-united, at her request, for a new Sonny and Cher Show, with singing and comedy but no pretense of love. The show was cancelled in 1977, but Cher -- then married to Gregg Allman -- continued touring with Bono until 1979. Afterward, she performed solo, or with her own band, or in duets with other singers. She re-emerged in movies with Robert Altman's Come Back to the Five and Dime, Jimmy Dean, Jimmy Dean (1982), and went on to great success as an actress in the 1980s and early 1990s. She was Oscar-nominated for Silkwood, and won the honor for her 1987 romantic comedy Moonstruck. In 1987, Sonny & Cher had a tearful reunion on Late Night with David Letterman, but her musical career continued while his had long-since fizzled. In 1998 Bono died after skiing into a tree. Four months after his funeral, Cher described hearing his disembodied voice reassure her from beyond the grave. "Don't worry about me, Babe", she says he said. "I'm fine. It's great here". Cher's singing career had its ups and downs, but every down period was followed by another hit. The longevity of her musical career has established several records, including making Cher the oldest female performer to chart a #1 hit, with "Believe" in 1999, when she was 53. She first hit the Top 100 with "I Got You Babe" in 1965, and last hit the charts with "Song for the Lonely" in 2002, a record-setting span of 37 years. She also holds records for the longest gap between #1 songs, from "Dark Lady" in 1974 to "Believe" in 1999. Cher has been her legal name since 1979, when she petitioned a court to have her middle and last names officially dropped. In 1990, Bono & Cher's daughter Chastity came out as a lesbian. Cher says she "went ballistic" at first, but within weeks she came to view her daughter's girlfriend as "a son-in-law." Cher has since become active with Parents, Families & Friends of Lesbians & Gays (PFLAG), and admitted to having had lesbian affairs herself in the 1970s. She says that her first tattoo, on her rear, reads "Hi, Sailor." Tim Doyle, "Star Cher confesses gay affair", Daily Mirror, 19 April 2002.